I've loved dogs since I was a kid. But my father was very allergic, so I had to love them from afar. 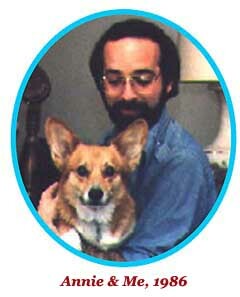 Then, in 1981, I got a Welsh Corgi puppy, the amazing Mail Order Annie. I've been learning about and teaching puppies and dogs ever since! In our 15 years together, Annie enriched my life more than I could ever have imagined. With her guidance, I went from clueless rookie to professional trainer. I promised Annie I'd pass along the lessons she'd taught me, and that’s why I started Day-One Dog Training in 1998. I love helping people and dogs better understand and enjoy each other. And more than a decade (and more than a thousand clients’ dogs) later, I'm still learning new things about dogs—from mine… and yours! I’ve put most of that knowledge into my book Puppy Kisses are Good for the Soul & Other Important Lessons You & Your Dog Can Teach Each Other (co-written by Annie). Puppy Kisses has a simple goal: to give readers a clear blueprint for building the best, most enjoyable relationship with their furry pals. I’ve written 15 books (including a trio of national best-sellers), articles and columns for magazines and newspapers (including the New York Times, Newsday, and the Baltimore Sun), and won awards for writing and producing radio public-service campaigns. I’ve also taught many writing classes and workshops over the past 25 years.